We are thankful for God’s strength each day. We had a full week with school and getting ready for guests. Arianna arrived yesterday and we are thankful that she is able to spend time in Hungary with us for Christmas. So thankful that God gives us opportunities to share about Him. I was on campus for my language lesson and I noticed a young lady in the bathroom looking around and asked her where she was from. She said she was from Pakistan and she was so happy to hear me speak English that she gave me a hug. We talked about school and I asked her how I can pray for her and she shared with me that she was a Muslim. She reminded me of the many students on campus that are stressed with exams but who are also open to prayer. We are asking God to use this to reveal Himself to her. “I” would do well on her exams and that she would see how God, not Allah, is answering prayer. God would allow our paths to cross again and/or other Christians who would share with her. Sophia and Abigail would have God’s peace about school. Courage to do the hard things and also to let go of what is not important. They would depend on the Lord. Asking God to prepare the hearts of Arianna and her friend Abi as they prepare to serve in South Asia. “I” will have his 2nd national medical exam on the 25th of December in Israel. Pray that he would be able to focus and not be distracted by the political issues. He would know that it is God who is helping him. Our friends are organizing a Christmas Eve Worship service on campus, pray that students who are not connected to any church as well as non-Christians would come and that they would see Jesus in what is said and through the people that they meet. We will have several opportunities to have non-Christians in our home as well as believers. Pray that we will be a light to those in darkness and an encouragement to believers. God would give us boldness and that we would not miss any opportunities that He gives us to speak about Him. Darrel and I would be faithful and that we would focus on the Lord. Thank you! Signing off until January! Have a blessed and Merry Christmas and a wonderful New Year! We were very blessed to spend some time Christmas day with our brothers and sisters in Christ at the small Baptist church in Újléta, which is a little less than an hour’s drive from Debrecen. 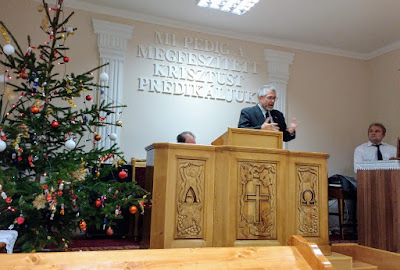 Our good friend and ministry partner Eduárd Nitkovszki leads the service there about once a month, and he invited Gary to bring the message on Christmas. The Lord knew what was needed and exactly when–as it turned out, Eduárd was getting sick and could barely speak, let alone preach! Gary spoke on “Who is Jesus,” an in-depth look at who Christ is; he ended with the question, “Who is Jesus to you?” It was an encouraging and yet challenging time of self-examination, as well as a wonderful celebration of God’s great gift of His Son, our Savior. We were missing our family in the U.S. on Christmas, so it was a special blessing to be among the precious people in Újléta in such a loving, family atmosphere. We both left feeling that they had blessed us much more than we had them! Pray for the church in Újléta, that they would be strengthened and encouraged, and that they would continue sharing the love of Christ with those in their community. We are thankful for God’s blessings. Thank you for praying for the girls! They have been working hard, a few panic moments, but God gave them courage to stay on task. We had some good conversations with a few international students followed by the Christmas tree lighting at DBU. Darrel is speaking at a church in Monroe City, Missouri. Our church is having a Lottie Moon Christmas banquet tonight and I will get to share some of our stories from Hungary. Darrel as he shares that others would be encouraged by the awesomeness of our God and the work that He is doing among Hungarians. God would direct my words so that others will see how God is at work in Hungary. God would give us wisdom and clarity as we prepare to return in January. Arianna will begin finals this week, pray that she will have God’s peace during this stressful time and that she would have the strength to study and ability to do well. As the people of Hungary celebrate St. Mikulas and consider their good and bad deeds, that they would realize their need for a Savior. “J”, a young lady who really wants to follow God, that God would show her and give her courage to take the next step as she desires to walk in obedience. Also that the enemy would not distract her. Below is an article about a Hungarian tradition that will happen this week. On December 6th Hungarians celebrate the day of St. Nicholas (St. Mikulás). St. Nicholas is the Hungarian version of Santa Claus. On this Day, St Nicholas visits children at home and at schools. At home children wait for Mikulás by leaving their polished boots at the window the night of December 5th. If kids have been good over the year St Nicholas fills their boots with treats, chocolates, mandarins, peanuts and small gifts such as toys and books. If children have been really naughty they get in their boots some goodies and a switch made of dry twigs (virgács) as a sign of warning. At homes where there are small children, usually a family friend dresses up like Mikulás and brings the presents himself to children. When Mikulás arrives, children sing songs or tell poems to him. Mikulás praises them for the good deeds and calls them out for their naughtiness. Before leaving, St. Mikulás gives gifts to the children. We hope you have a blessed Christmas! This has been an interesting week. God allowed one of our friends in the states to join Him after her battle with cancer. We will miss her. You can pray for her family as they grieve. We were blessed to spend time with some friends who are pastoring a church in a nearby town where we walked through the Christmas market and found the best hamburger joint. It is truly hard to find a good hamburger in this part of the world. Darrel gave his final exam. God is at work in the lives of the students in his class! (more later) Thank you for praying! The girls went with me to Budapest for PT and we had a lot of fun Christmas shopping. We ended up wondering into the Jewish quarter of Budapest where the 2nd largest synagogue is located. There are also two Orthodox synagogues located nearby. The girls had their first taste of hummus. Yum! We had our last coffee house for the semester on Thursday. We are looking forward to celebrating Christmas with some other M’s who are from a different part of the world. Also G. (our Jewish friend) and her boyfriend, her brother, and J. will also be joining us. Our friends who will be joining us will be refreshed and encouraged in their service for the Lord. Christmas day as we share the story of Jesus with our guests. They will see His love through our lives and desire to know Jesus. Peace for us as we anticipate the packing and preparing for when we return for our stateside time in January. God would direct the hearts of our Monday night group and that they would see who it is that they are to invest in and to disciple. Gary and Carolyn Miller as they minister to Gary’s mother who is very sick. Pray that God would give them wisdom and strength.